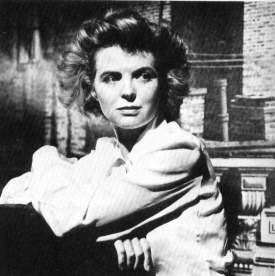 A Broadway actress who made the trek west to reprise her stage role as the title character in the film version of CLAUDIA (1943), Dorothy McGuire decided to stay a while and eventually made almost thirty more films including three Best Picture nominees. In one of her earliest films under contract to 20th Century-Fox, McGuire gave an altogether memorable performance as a struggling young mother in the Best Picture nominee A TREE GROWS IN BROOKLYN (1945), one of my all-time favorite films. A coming-of-age story centered around a young girl (played by Peggy Ann Garner) growing up with her family in turn-of-the-century New York, the film was adapted from the classic novel by Betty Smith and also features James Dunn and Joan Blondell in critical supporting roles. Marking the Hollywood directorial debut of Elia Kazan, A TREE GROWS IN BROOKLYN is a beautiful story, touchingly rendered, and a credit to everyone involved, McGuire especially. 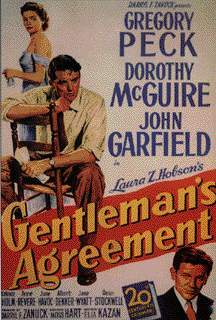 A poster from the Best Picture of 1947, GENTLEMAN'S AGREEMENT, which also starred Gregory Peck, Anne Revere, Celeste Holm and John Garfield. McGuire received her first and only Best Actress nomination for her role as Kathy Lacey in this moving post-war film addressing socially accepted anti-Semitism. "Don't be frightened. It isn't love." --as Pat Ruscomb in TILL THE END OF TIME (1946). "You're pretty grown up for a kid your age." --as Pat Ruscomb in TILL THE END OF TIME (1946). "All I'm saying is, let them look." --as Pat Ruscomb in TILL THE END OF TIME (1946). "Course I'm smart. There were lots of smart girls like me. We had a choice and we made it. Why John married me -- because when he went to war, he wanted to be able to dream of home. That's why I married him -- I wanted him to have that dream. The thing I didn't count on was that the end of the war and John's coming home would be my dream. And the war is over, and John isn't coming home, and I'm stuck with my dream." --as Pat Ruscomb in TILL THE END OF TIME (1946). 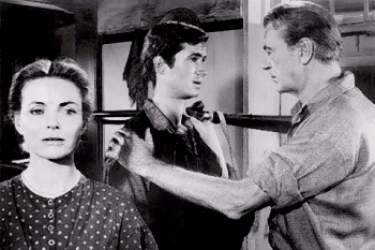 A still from William Wyler's Best Picture-nominated FRIENDLY PERSUASION (1956). This story of a Quaker family's struggle to maintain its identity during the Civil War sounds like very solemn subject matter, but it's actually very amusing at times too. 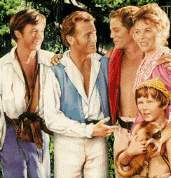 Also starring Gary Cooper and Anthony Perkins (both shown with McGuire above) with Marjorie Main, the film received a total of six Oscar nominations including one for Pat Boone's rendition of the film's title song. "Thee I Love" (clip) sung by Pat Boone (a .MP3 file courtesy Varese Sarabande). "Polka at the Fair" (clip) by Dmitri Tiomkin (a .MP2 file courtesy Varese Sarabande). 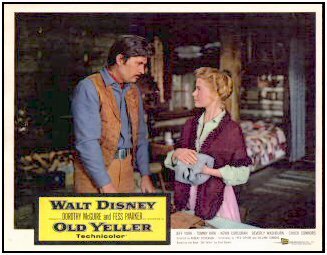 A poster and publicity picture from two classic Disney films, both of which featured McGuire as mother to Disney contract child stars Tommy Kirk and Kevin Corcoran: OLD YELLER (1957) with Fess Parker and SWISS FAMILY ROBINSON (1960) with John Mills. McGuire being introduced to her new tree house by John Mills and sons in SWISS FAMILY ROBINSON (a 8.7MB .MOV file courtesy The Walt Disney Company). McGuire and sons (Kirk and Corcoran) confront Chuck Connors when he comes to take back his dog in OLD YELLER (a 8.3MB .MOV file courtesy The Walt Disney Company). "Three Coins in the Fountain" (clip) sung by Frank Sinatra (a .MP3 file courtesy Capital Records). "Theme" (clip) by Max Steiner (a .MP3 file). 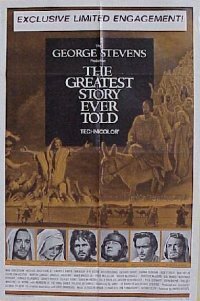 "Theme" (clip) by Alfred Newman (a .MP3 file).